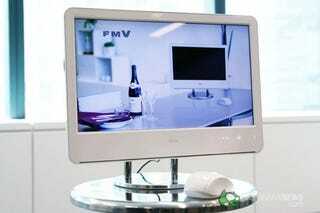 The iMac has spawned a couple of lookalikes in the past, but none quite so similar to it as Fujitsu's new FMV F-A50. Ok, so it's the previous gen white iMac we're talking about, but look at that slot-loading DVD drive... right where it should be! We almost prefer the design of the Fujitsu's stand too, since it allows you to adjust the height of the unit as well as the tilt: one better than the iMac. Check out its specs below, after ogling its sleekness in the gallery. The screen of the F-A50 is a 16-inch 1366 x 768 pixel widescreen, and inside there's a Core 2 Duo running at 2.1GHz, with 2GB of RAM and an Intel x3100 graphics unit. It runs Vista Home Premium SP1. There's also a 250GB SATA drive, DVD recorder drive, wi-fi, Bluetooth, a type-2 PC card slot, and an SD card slot. These last hide beneath a flap, along with some of the USB ports. Though it doesn't seem to have a webcam, it does at least promise to be a quiet machine with only around 30dB of noise according to Fujitsu.